Droom understands why trust is the most important thing when you are going to buy a used vehicle. Buying a used automobile from an unknown person or dealer is full of pain points, friction and pitfalls. Droom has created a series of trust factors that bring the much-needed trust for buyers and help them to take more informed decision. Who is the seller ? Can I trust him? What if the seller is not truthful to me? How do I know if the documents are genuine? What if the seller is not a genuine seller? How do I know the exact condition of the automobile? How do I develop comfort if the item is not stolen or belongs to someone else? Is the vehicle inspected and certified? What if the automobile has significant issues or problems? How do I know if the odometer reading is not tampered? Am I paying the fair market value? How do I know that the automobile has genuine parts and nothing has been altered or removed? At Droom we feel very passionate about how to bring trust in buying and selling equation for a new or used automobile. Droom has developed a very comprehensive, unique and proprietary approach to bring back the trust and is called Full Circle Trust Program, which covers various aspects of your buying experience. There are hundreds of unknowns when you are buying a used vehicle. Droom full circle trust program helps buyers to take more informed decision and avoid risks that stem from unknowns. Seller knows a lot about the vehicle but has no incentive to be truthful to you other than moral obligation. In fact, in many cases, seller is not only lying but he has also deliberately tampered with the vehicle especially odometer reading for his selfish and unfair gains. Droom makes sure that you are only dealing with reliable and verified seller. Droom offers buyer protection so that your token amount is safe & refundable. Droom offers Droom Inspection Report on the vehicle you are buying. Droom also forces sellers to disclose more information about the items while creating a listing vs. any other online company, and finally sellers are also rated by buyers from Droom community and that gives new buyers an opportunity to develop more comfort about a rated seller. Droom Full Circle Trust Score is based on Droom’s proprietary technologies and algorithms that consider trust factors that are important while buying used automobiles, such as auto inspection, warranty, verified seller, attractiveness of pricing for buyer, and level of disclosures by the sellers. Droom Full Circle Trust Score will allow buyers to develop more objective assessment and comfort around the vehicles they are considering buying. Our Full Circle Trust Score is equally attractive for sellers who want to adopt best practices and offer nothing but the best to the buyer community. Seller listings with higher trust score will automatically emerge as winners on Droom’s marketplace. This score is based on listing details disclosed by Seller, such as Number of Images, Quality of Images, Description, etc. This score is based on the listing price relative to market price of similar vehicles and Droom’s algorithmic pricing engine i.e. Orange Book Value. Every seller is unique, hence this score is based on seller related factors such as the Ratings given to them by buyers, whether the seller is verified or not, etc. Every seller maybe trustworthy, but this score is based on factors which enhance trust on the vehicle such as inspection report, warranty, Kms driven etc. We feel very strongly that knowing your seller is super important. At Droom you only deal with reliable and trustworthy sellers. Droom verifies every seller and if the seller information is fully verified, the sellers are issued Verified Seller badge that are visible to buyer. Also, while at Droom an individual or a professional seller/dealer can sell, it cross verifies more detailed information for professional sellers/dealers. 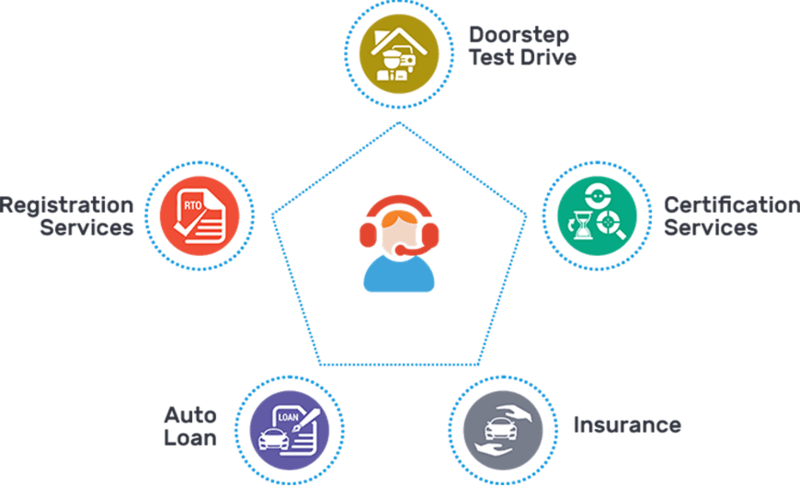 Droom offers independent, objective and unbiased automobile inspection reports. These reports are independent and follow Droom’s inspection methodology, thus do not favour a seller. A reputed partner of Droom performs the inspection and prepares the report. For every item that is being sold at Droom by an individual or professional seller/dealer, Droom asks every seller to fill a seller declaration form on self-disclosure basis. This form is uniquely designed so that seller can disclose any unknown problems in the automobile they are selling. This process adds great level of transparency in the buying process for the buyer. In case the seller is not truthful or fully transparent, Droom inspection report can reveal whether the seller declaration is passing or failing. Unlike online classifieds or online auto discovery platforms where you see very limited information of the item you want to buy, Droom listing has very detailed information. We believe customers deserve to know and see each and every aspects of the vehicle they are buying. We have created a unique approach how a seller creates a listing. The listing creation process at Droom may mean a few more steps for the seller but it results into much higher level of transparency for the buyers. The Droom Listing is a symbol of higher trust, safety and convenience. At Droom, buyer can read product and seller ratings and reviews to make more informed decision. Buyer can also rate the seller from whom he bought an item or can rate the product bought. If a buyer does not have a good experience or did not like the product, he can rate the seller or the product accordingly. Because all users get to see the ratings and reviews for all the seller and the products, it makes buyers more informed. Need more surety and trust? Purchase FCTS Premium Diagnostic Report (non-refundable) and know all about the components and their scores comprising the transparency score, health score, pricing score and seller score. All in Rs. 29 only! What is Droom Full Circle Trust Score? Droom Full Circle Trust Score is based on Droom’s proprietary technologies and algorithms that take into account trust factors that are important while buying used automobiles, such as auto inspection, warranty, verified seller, attractiveness of pricing for buyer, and level of disclosures by the sellers. Droom Full Circle Trust Score will allow buyers to develop a more objective assessment and comfort around the vehicles they are considering buying. Our Full Circle Trust Score is equally attractive for sellers who want to adopt best practices and offer nothing but the best to the buyer community. Seller listings with higher trust score will automatically emerge as winners on Droom’s marketplace. Why Droom Full Circle Trust Score matters? Most of the used automobiles sold in India have their odometer tampered, and may have many unknown issues and known issues, which are typically not disclosed by sellers. Droom Full Circle Trust Score is the most comprehensive and scientific way to help consumers develop comfort in their buying process. Is a higher score better? The short answer is yes. However, right now, our methodology is so strict that very few sellers are getting more than 8 for any listing. So, when you see score of 6 or above, it is considered to be really good. Also, in addition to just looking at the overall Droom Full Circle Trust Score, one must notice the four major buckets as well i.e. Transparency, Seller, Pricing and Health. It is possible, that the overall score for one listing is low due to one particular bucket. What is the methodology behind Droom Full Circle Trust Score? Droom Full Circle Trust Score is built on best practices in buying and selling used automobiles. So, anything that is looking out for buyers’ interest is a part of Droom Full Circle Trust Score. We used our proprietary methodology and data science to come up with the score. The Droom Full Circle Trust Score is based dozens of trust factors divided into four major buckets i.e. 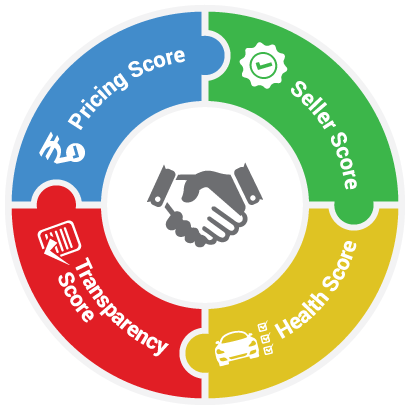 transparency score, pricing score, seller score and health score. This score is based on listing details disclosed by Seller, such as Number of Images, Quality of Images, Description, History Report availability etc. This score is based on the listing price relative to market price of similar vehicles and Orange Book Value. Every seller maybe trustworthy, but this score is based on factors which provide more trust on the vehicle such as inspection report, service logs, warranty and certification etc. How it is beneficial for a buyer? The higher the score, the more trustworthy and reliable is the listing. Full Circle Trust Score will allow buyers to develop a more objective assessment and comfort around the vehicles they are considering buying. How it is beneficial for a seller? What can sellers do to score better on Full Circle Trust Score? Every seller has equal opportunity to score well on Droom Full Circle Trust Score parameters as long as they are following best practices and watching buyers’ interest. For the transparency bucket – please make sure that you upload more pictures, you have higher quality pictures, you write very clear description of the listing, and you fill even all the non-mandatory information while creating a listing. For seller buckets – please verify yourself - that is the single biggest factor why you can score better in seller score bucket. Beyond that, if you are a professional seller and registered as pro-seller with Droom, you will have higher score and finally the remaining seller score depends on seller ratings and reviews you receive from buyers. For pricing bucket – the score is simple and straightforward. The more competitive price you keep for the items you are selling, the higher your score will be for pricing. So, price your items to sell and you will see your overall score zooming up. The most important bucket is the health bucket – for this - offer ECO inspection, warranty, fill clearly seller declaration, upload a copy of RC, upload copy of insurance, and upload copy of service logs to score high in this bucket. Droom offers independent, objective and unbiased auto inspection reports from various preferred vendors at pre-negotiated price and defined service level agreement. Sellers can take full benefit of this program. Can Droom help in getting better score? Droom can only share the best practices on how a seller can score higher with his/her listing in Droom Full Circle Trust Score. Buying certified Listing Tools also help increasing overall FCTS. However, the score is an outcome of attractiveness of a seller, quality of his/her listings, health factors e.g. auto inspection, and pricing etc. Droom is an objective, unbiased marketplace and will not directly or indirectly help in getting better scores. Provide Certified Listing Tools – A package of OBV, History and ECO inspection reports. Auto Inspection from Droom fetches you the maximum score. Don't wait, Order now! Price your vehicle as close to the industry standards' (OBV) recommendation to improve your FCT Score. Verify your phone and email to become a Verified Seller and earn the buyer's trust. Offer warranty with your vehicle listing to achieve better score. Your seller rating is impacted by the following factors: Payment, Communication, Viewing & Scheduling, Handover & Delivery, Professionalism. Try to improvise on these factors. Upload more and high quality images of your listing. Also consider uploading a video of your listing. Offer Returns as an option in your listing to earn buyers’ trust and increase your score. Offering free test drive helps to earn more score. Become a Droom Premium Pro-Seller and get access to several seller tools and analytics, along with a higher seller score. Provide as much information as possible in Basic Facts and Key Factors. Full Circle Trust Score is based on Droom.in proprietary technologies and algorithm that consider trust factors that are important while buying used automobiles, such as auto inspection, warranty, verified seller, attractiveness of pricing for buyer, and level of disclosures by the sellers. Full Circle Trust Score will allow buyers to develop more objective assessment and comfort around the vehicles they are considering buying. Our Full Circle Trust Score is equally attractive for sellers who want to adopt best practices and offer nothing but the best to the buyer community. Droom.in claims no responsibility for accuracy or correctness of the information listed by seller on Droom.in and cannot be held liable for any decisions made based on the Full Circle Trust Score. The information provided is “as is” and without warranty of any kind, either express or implied, including, but not limited to, the implied warranties of merchantability, fitness for a particular purpose.